What are the import procedures in Japan to move goods? How to import to Japan? Explain about import registration process, cargo movement to Japan from overseas countries, Import delivery process in Japan etc. This post explains about step by step procedures that need to be finished with Japan government authority for importation to Japan. If you need to import goods or services, a onetime registration procedure is being completed in most of the countries. Such import export licence may be obtained from concerned government department of Japan if required. 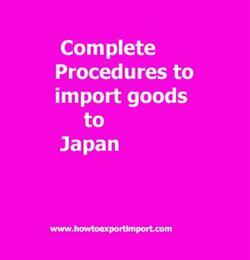 Usually, import of goods to Japan requires three categories of procedures wherever required. One-time registration procedures to act as an Importer in Japan, Specific import licence to import goods to Japan if applicable, and certain certification from concerned government agencies of Japan related to each import wherever applicable. Most goods can be imported into Japan without controls, although transactions must be reported to the Ministry of Economy, Trade and Industry (METI) through banks authorised to deal in foreign exchange. Japan Customs under the Ministry of Finance regulates inflow and outflow of goods in Japan. Any person wishing to import goods must declare them to the Director-General of Customs and obtain an import permit after necessary examination of the goods concerned. Declaration must be made by lodging an import (Customs duty payment) declaration describing the quantity and value of goods as well as any other required particulars. The documentation may also vary depending on the country of origin or destination. Thus, documents may have to be prepared in a particular way to comply with the requirements of the import or export country. Understanding the right export documents is essential for smooth import and export procedures. This post explains about different phases in import process that every importer needs to go through in Japan. How to import to CHIBA? Formalities for import to HACHINOHE . Procedures to import to HAKATA. Need to import to SHIMIZU. Explain to import to CHIBA. Information to import to TOYAMA. Step by step process to import to HAKATA. Methods to import to KAIMINATO. Guidelines to import to MIZUSHIMA Please guide to import to TOKYO. Help to import to. Procedures required to import to TOYAMA. Requirements to import to YOKKAICHI. Clarifications to import to KOHAMA. How can I import to HACHINOHE. What should I do to import to KOHAMA.